Our students will be competing in: Chapter records, Job interview, Vegetable Judging, Commodity Exhibit, and Educational Exhibit. 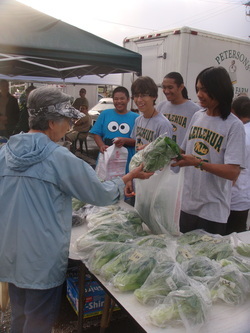 Leilehua High School will be selling fresh produce every Thursday at Wahiawa Hong Won Gi. We have completed one month so far selling produce at the Farmer's Market and it is a great success. We will continue to sell until further notice. Come by and support our Local Farmers!